The 2018 Strathearn Eventing Grass Sickness Hunter Trials takes place near Perth on Sunday May 27th. This popular annual fixture started in 2012, since when it has raised an amazing £6350 for EGS research. 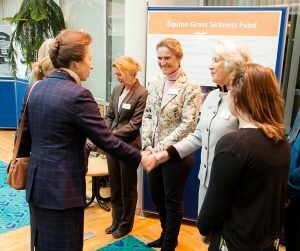 In recognition of this achievement the Equine Grass Sickness Fund recently invited Strathearn’s Hazel England and daughter Sarah Houlden to attend a reception at Moredun to meet EGSF patron HRH Princess Anne. Grass sickness has long been a cause close to the heart for Hazel and Sarah. Five generations of the family have bred horses here at this popular Perthshire venue, with Hazel’s father breeding working Clydesdales long before the current generation of outstanding young sports horses. Young horses are at increased risk of grass sickness, and as the Englands know, very careful management is required to help reduce the risk of the disease. Almost twenty years ago Hazel and Sarah nursed a young palomino not only back to health from grass sickness at a time when such a feat was almost unheard of, but the horse also went on to have a successful competition career. 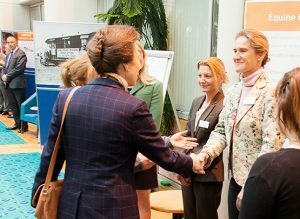 Raising awareness of the disease is very important to Sarah, who finds that the disease is little known and that people are often unaware of the steps that they can take to reduce the risk, and are also unaware of the research effort which aims to discover the cause and a means of prevention of the disease. The hunter trials helps raise awareness and funds for EGS research and is a true team effort involving the whole family and many loyal volunteers who give up their time year after year to help.